The results of flashing, however, can be gratifying or frustrating, depending on how one sees things. Flashes often give humans red eye, and I don’t mean conjunctivitis (AKA pink eye). 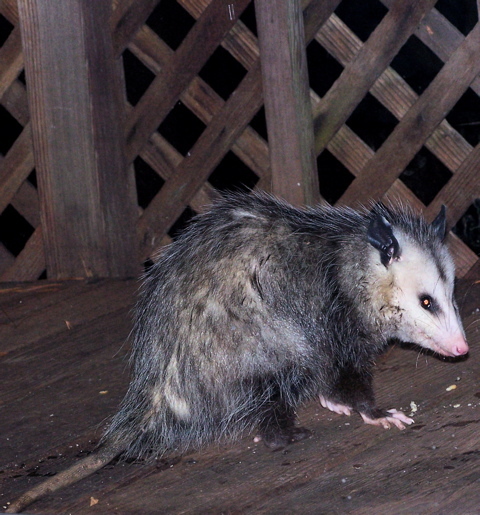 In fact, possums are the species that end up with pink eye in flash photography. 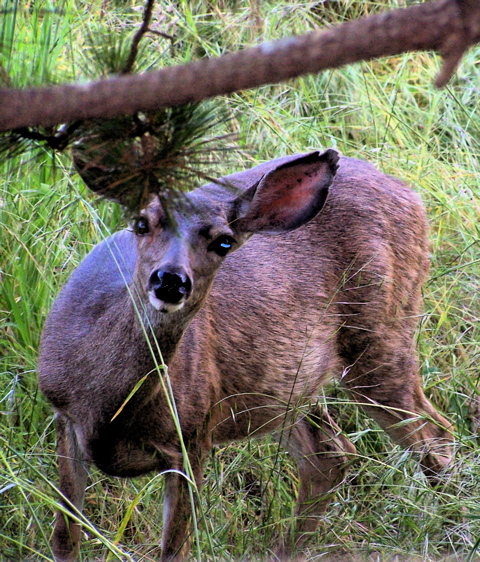 Blacktail deer come out with blue eye while raccoon eyes can end up white or green or both. 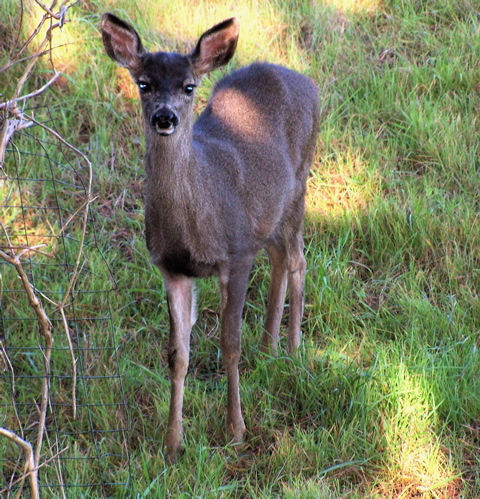 A blacktail fawn gets “blue eye,” not “red eye,” from being flashed. However, the reason flashes — which are often vital for photographing nocturnal wildlife — give these animals’ eyes their various colors is not the same reason flashes can make human eyes look red. The eyeshine of possums is pink. Unlike humans, many other mammals, especially nocturnal creatures, have a mirror-like surface, the tapetum lucidum, behind their retinas. The eyeshine of a deer caught in the headlights is a reflection off the tapetum lucidum. The tapetum lucidum helps nocturnal animals hunt and forage in low light. Here’s how. Light from outside the eye passes through the iris and the retina and then bounces off the tapetum lucidum back through the retina. 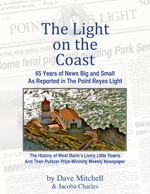 This magnifies the intensity of the light reaching the rods and cones of the retina, which are what sense light. However, the color of the tapetum lucidum differs from species to species, which is why rabbits have orange or red eyeshine while dogs are often green or blue. 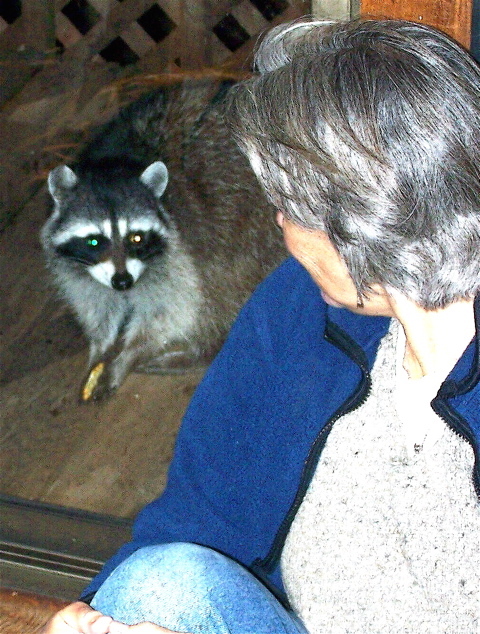 Showing both green and white eyeshine, a raccoon looks through my kitchen door at Nina Howard of Point Reyes Station. Not all animals have round pupils like those of human eyes. In the same way we squint to see more clearly, some animals’ pupils are naturally narrow to sharpen their vision — perhaps somewhat offsetting any blurring their tapetum lucidum might cause. The pupils of foxes and small cats, for example, are vertical slits, which help these predators notice when any prey is scurrying around off to their sides. The pupils of goats, sheep, and deer are horizontal slits, as can be seen in bright light; this gives them better vertical vision on steep terrain. When I spotted a blacktail doe grazing in the shade of a pine tree outside my bedroom, I opened a window to take a picture. The doe looked up and saw me, but she appeared oblivious to being flashed and went back to grazing. Notice her horizontal pupils. Surprisingly, wildlife including birds do not usually show any reaction to sporadic flashes — even those directly in their faces— but a quick succession of flashes gets their attention. for posing for this posting. I love the bemused expression on the deer. Funny stuff, Dave, funny stuff. , to preserve its beauty and wonders! Although I’ve sometimes gotten red eye when using a flash on dogs, more often I get eye shine of different colors with wildlife. In fact, in some places there are nighttime tours where animals are identified by the color of their eye shine. As for the identity of the model, it’s given at the bottom of the posting. Sparsely Sage and Timely is powered by	WordPress 4.9.10 and delivered to you in 0.401 seconds using 52 queries.